Our glass Tissue Floatation Water Bath has been developed using microprocessor controls and a modular design that has improved reliability and precision. The unit is low profile with a removable rectangular glass basin for easy cleaning. The glass basin is illuminated by LED light from the side allowing clear observation without glare against the black background. There is an ON/OFF switch on the control panel for the LED light. Temperature settings are controlled by push buttons for accurate and precise control and the easy to read LED displays show both set temperature and actual temperature. The corrosion resistant, stainless steel temperature probe flips down into place. The probe has a thermostat sensor inside that turns off when it is lifted up and re-starts when placed back into the basin. The Tissue Embedding Station is a complete system designed for embedding tissue in paraffin. The embedding center embodies a clever modular design allowing laboratory workflow and space issues to determine the layout of a complete footprint dimension of 35" x 24" x 31" (889 x 609 x 787mm). The paraffin workstation (TEU-P) contains a 2.0L paraffin reservoir and 2 additional tanks for molds and cassettes. These additional tanks provide a controlled heated environment for the processed cassettes and eliminate the xylene contamination from the paraffin reservoir tank. Each tank can be programmed individually for temperature. The paraffin reservoir has a convenient removable screen for eliminating debris. 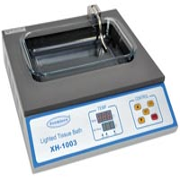 The Tissue Embedding Unit contains a heated worktable with an easily accessible built-in forceps warmer. Both of these are also independently temperature controlled. A recessed LED lamp provides bright illumination for the worktable. A paraffin waste drawer handles overflow from the worktable and forceps warmer. The dispenser nozzle for the molten paraffin has its own temperature control and dispensing can be operated by touch plate or foot pedal that is included with the unit. All 5 independent temperature controls utilize 4 pre-set temperatures for each area. The Tissue Embedding Station features a programmable day/time selector that includes a full 7-day selection option. The granite cool top offers the opportunity for tissue orientation prior to moving the mold to the cooling unit. The cooling unit (TEU-C) provides a large 12" x 12" (304.8 x 304.8mm) surface area for blocks. The lowest cooling temperature for the unit is -30°C/-4°F. This Tissue Embedding Station delivers a high level of versatility and control, typically seen on higher priced instruments. The Tissue Embedding Station presents a comprehensive system in an attractive and functional package designed for the active and progressive clinical or research histology laboratory.